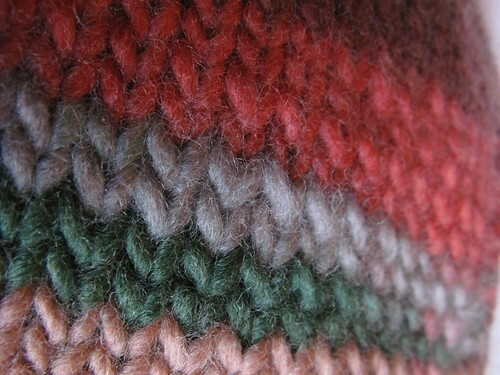 Isn’t this yarn perfect for christmas knitting with its reds, greens, gold and silver? It’s called Zitron Opus 1, it’s 100% organic wool infused with jojoba and aloe. I just love the colors, and it is SUPER soft! The best part is that I got it at 20% off at Green Planet Yarn’s make-your-own-sale on black Friday. I’m not one to go fight the crowds on black Friday, but I will not miss a make-your-own-sale from GPY 🙂 You get to pull out a poker chip at checkout with 20, 40, 80, or 100% off! I’ve pulled two 40% off chips over the last two years!! I can’t say too much about what I’m going to do with this yarn, in case the recipient reads this blog, but jojoba and aloe infused yarn begs to be made into something to comfort feet! !